Need help? Sangertown Square’s friendly Customer Service members can help you! Customer Service is located at the Mall Office; off of Center Court near Lids. Customer Service hours are Monday – Friday 9am – 5pm. Ask them at [email protected] or call 315.797.8520 extension 1. Do you need to contact Sangertown Square’s security team? Call 315.797.8545. Looking for your favorite shopping, dining or entertainment destination? View our directory here. We offer ATM’s located in various areas across the center. You have find each one highlighted on the directories found here. Strollers are available for rental for a nominal fee. Strollers are available at the standalone mall entrance in the JC Penney wing. Our friendly and knowledgeable staff is present seven days a week, providing you with a safe and pleasant shopping experience. The New Hartford Police Department also has their own substation at the mall. Police officers can be seen frequently throughout the mall often providing educational information on public safety. Restrooms are located off of Center Court by Lids. View restroom locations on our directory here. Sangertown Square opens early for your convenience to enjoy walking the center prior to stores opening. 7am until 10am Monday- Saturday and 7am-11am on Sundays. Join your friends and neighbors at Sangertown Square for healthful walking at your own pace in climate controlled comfort. Having an event? Organizations are invited to host their events at the mall. Call the mall office at 315.797.8520 to request additional information or e-mail [email protected]. 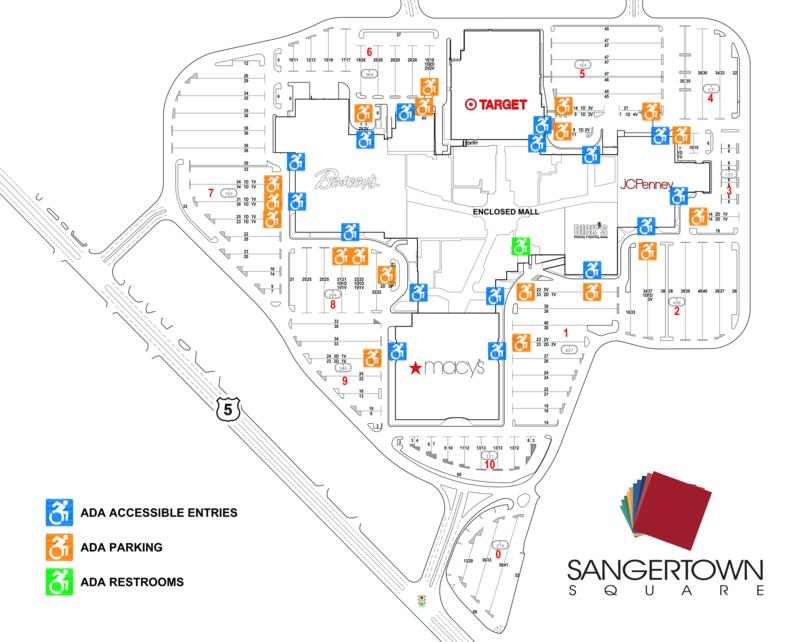 WiFi is FREE at Sangertown Square, simply select “_Free _WiFi_Sangertown_Mall ” from your device’s listing of available networks! Designated parking at most mall entrances. Automatic doors equipped at most main entrances. Wheelchairs are available for rent, free of charge at the Mall Office Monday- Friday 9am – 5pm. If you need a wheelchair at any other time, please call Sangertown Security at 315.797.8545. ADA accessible entrances are identified below and ample parking is available throughout the site. Thank you for shopping at Sangertown Square. Sangertown Square is a smoke free facility. The consumption of alcohol is permitted in licensed premises only.